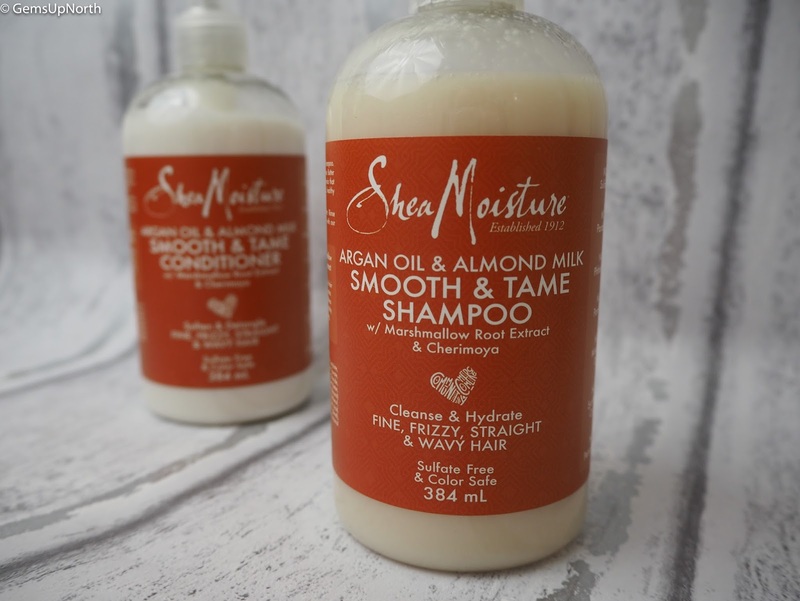 Lately I’ve had the chance to try more and more organic beauty products including this shampoo and conditioner from SheaMoisture. I think it’s good to try products with organic ingredients and natural elements, these can really up your beauty Game! SheaMoisture is a natural, organic and sustainably-produced brand that have been around for 4 generations. Sofi Tucker started selling Shea nuts at a market in Bonthe in 1912 and by 19 years old was selling Shea butter, African Black Soap and homemade hair care and skin care products all over the countryside. 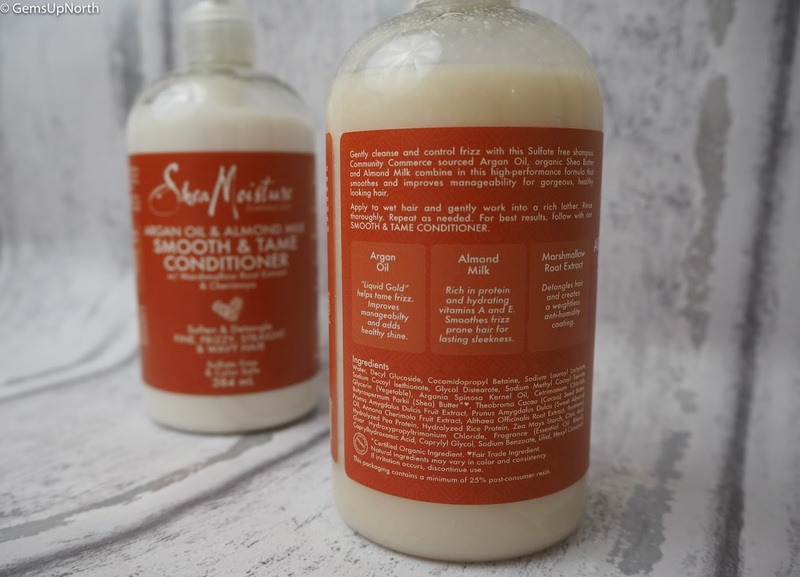 SheaMoisture is her legacy and is going strong, the products are now available in Superdrug in the UK and can be purchased online. They don't test on animals and strive to be sulfate and paraben free; also 10% of SheaMoisture community sales go towards women-led businesses! 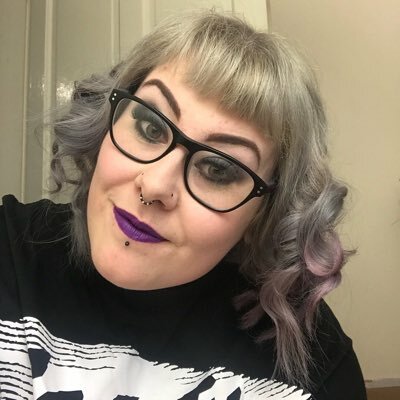 I was kindly sent the Argan Oil & Almond Milk Smooth & Tame shampoo* and conditioner* to try out, I’ve been using them both for over a month now and my hair feels super soft and more manageable which is a big plus for my fizzy, crazy hair. 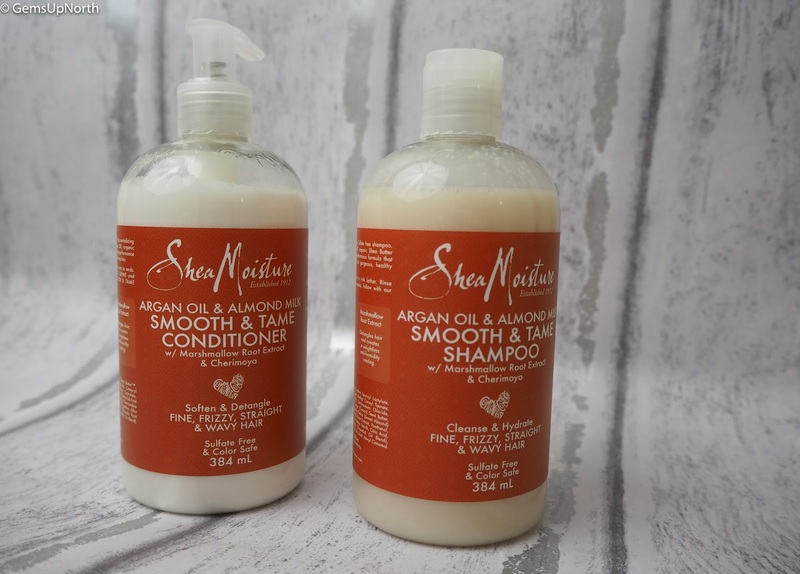 The Argan Oil & Almond Milk Shampoo* has a thin consistency which smooths onto my hair easily although the product doesn't lather up, it soaks into the hair nicely. I once read that shampoos that lather up a lot have a lot of chemicals and ingredients in so I was glad to find this SheaMoisture shampoo not to lather up because I know it has natural ingredients. The sweet scent fills the bathroom when using the shampoo and is really uplifting. The product is said to control frizzy hair and I believe my hair is more manageable after using SheaMoisture for the past month or so, my hair feels smoother and when I blow dry it, I've found its not as fizzy and wavy. The Marshmallow Root Extract helps to detangle hair and adds a anti-humidity coating which helps manage my hair too! The lightweight formula has no sulphates, no parabens, no phthalates, no paraffin, no mineral oil, no synthetic colour and no petrolatum; it really is a natural product! I would like it if the shampoo had a pump action head like conditioner though, this would make applications in the shower a breeze. After applying the shampoo I've been using the Argan Oil & Almond Milk Conditioner* to compliment my hair care routine. The conditioner has the same scent as the shampoo and also doesn't contain any sulphates, parabens, phthalates, paraffins, mineral oils, synthetic colour or petrolatum so its another amazing natural product. I absolutely love the pump action head on the bottle and I believe I have used less product because of the pump as I'm not just putting an amount in my hand. 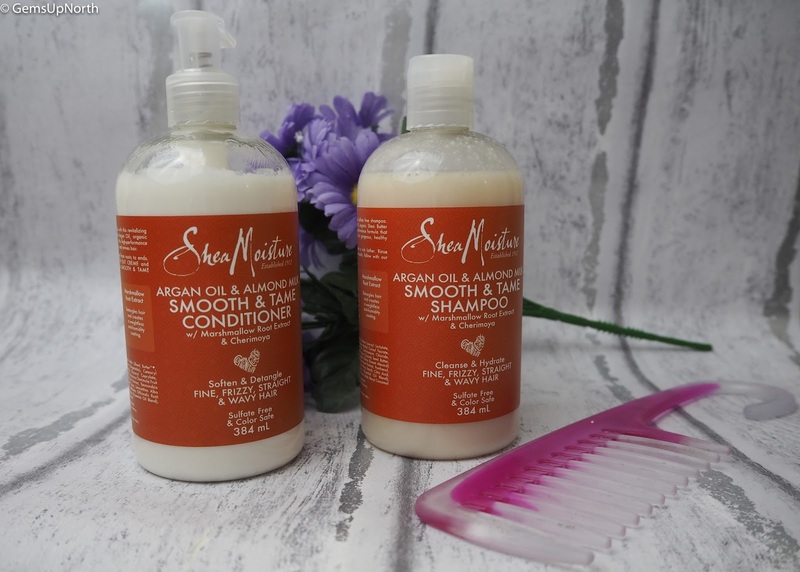 With having the same ingredients as the shampoo using the conditioner adds to the benefits of using the shampoo, the Marshmallow root extract adds the anti-humidity coating which is weightless and helps to detangle my hair, the Argan Oil tames the frizz whilst adding shine and the Almond Milk is rich in protein and hydrates my hair with Vitamins A and E.
Each bottle is a good size having 384ml of product inside each and SheaMositure have other scents and ranges, you can pick them up in Superdrug stores and online. *PR Sample - all thoughts and opinions are my own, see my disclaimer for more information.